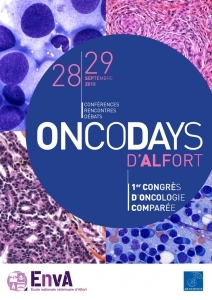 The National Veterinary School of Alfort will bring together Veterinarians and Doctors to talk about comparative oncology on September 28th and 29th. Diagnosis, assessment of extension, methods of management, genetics, prognosis, targeted therapy, nutritional aspects, monographs: interventions in the form of doctor / veterinarian pairs will convince you that it is time to establish bridges between these two universe of medical knowledge, which is one! Cani-DNA partner in the project CRB-ANim will participate in a session "The dog as a spontaneous model of cancer in humans: a genetic and therapeutic benefit."